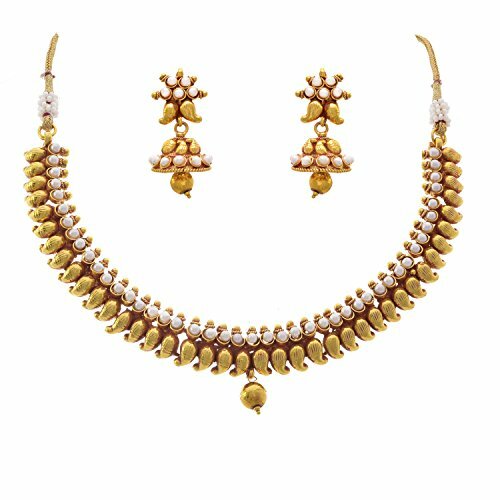 Home > Posts tagged "Gram"
JFL – Traditional Karismatic Kemp Kaerie Designer One Gram Gold Plated White Pearl Necklace Set with Earring for Women and Girls. Base Material – Copper alloy. Stylish and Trendy Necklace Set from the house of JFL, perfect for all occasions. QUALITY – All our Jewellery is Export quality, Anti-allergic, High Gold Polish, Copper alloy, rust and corrosion resistant. No lead or Nickel so it wont irritate your skin. No Shisha hence light weight. The highest quality of gold plating further ensures a long-lasting shine. CARE – No direct Perfume/Deo/Chemicals on the Jewellery. It is advisable to store jewellery in an air-tight container as sent by Us (or in zip lock pouch). First wear your makeup, perfume – then wear your jewellery. Clean it with dry and soft cloth after wearing. This will keep your jewellery shining for years. 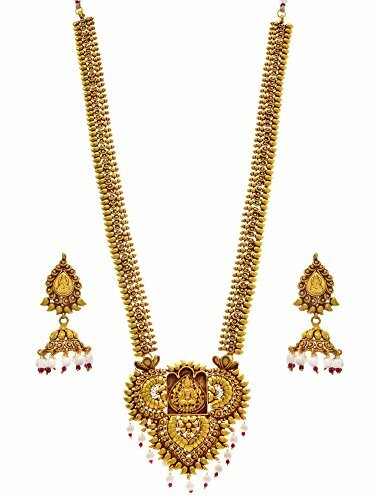 JFL – Traditional Ethnic Temple Laxmi Goddess One Gram Gold Plated Designer Necklace Set/ Jewellery Set Studded with Stones for Women & Girls. Base Material – Copper alloy. Stylish and Trendy Necklace Set from the house of JFL, perfect for all occasions. 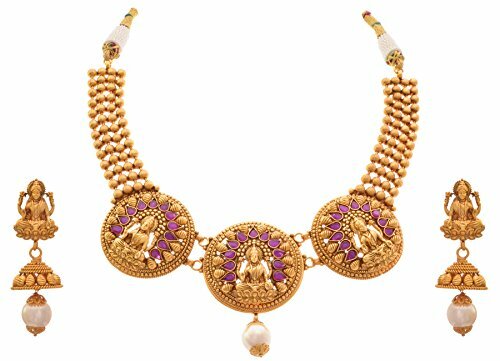 QUALITY – All our Jewellery is Export quality, Anti-allergic, High Gold Polish, Copper alloy, rust and corrosion resistant. No lead or Nickel so it wont irritate your skin. No Shisha hence light weight. The highest quality of gold plating further ensures a long-lasting shine. CARE – No direct Perfume/Deo/Chemicals on the Jewellery. It is advisable to store jewellery in an air-tight container as sent by Us (or in zip lock pouch). First wear your makeup, perfume – then wear your jewellery. Clean it with dry and soft cloth after wearing. This will keep your jewellery shining for years. 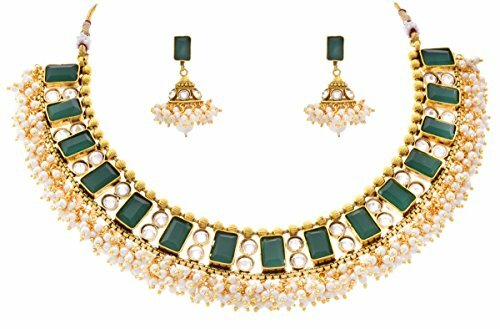 JFL – Traditional Ethnic Temple Magnificent Mahalaxmi One Gram Gold Plated Matt Gold Pink & Green Designer Necklace Set for Women and Girls. Base Material – Copper alloy. Stylish and Trendy Necklace Set from the house of JFL, perfect for all occasions. QUALITY – All our Jewellery is Export quality, Anti-allergic, High Gold Polish, Copper alloy, rust and corrosion resistant. No lead or Nickel so it wont irritate your skin. No Shisha hence light weight. The highest quality of gold plating further ensures a long-lasting shine. CARE – No direct Perfume/Deo/Chemicals on the Jewellery. It is advisable to store jewellery in an air-tight container as sent by Us (or in zip lock pouch). First wear your makeup, perfume – then wear your jewellery. Clean it with dry and soft cloth after wearing. This will keep your jewellery shining for years. 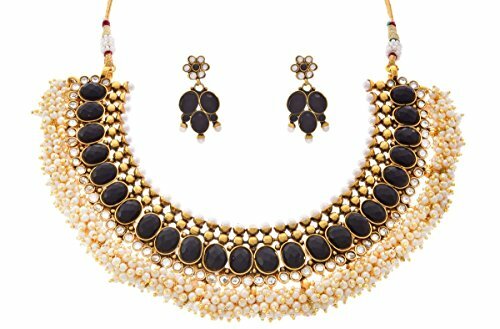 JFL – Traditional Ethnic One Gram Gold Plated Kundan Pearl Cz American Diamond Designer Necklace Set / Jewellery Set with Filigree Work for Women & Girls. Base Material – Copper alloy. Stylish and Trendy Necklace Set from the house of JFL, perfect for all occasions. QUALITY – All our Jewellery is Export quality, Anti-allergic, High Gold Polish, Copper alloy, rust and corrosion resistant. No lead or Nickel so it wont irritate your skin. No Shisha hence light weight. The highest quality of gold plating further ensures a long-lasting shine. CARE – No direct Perfume/Deo/Chemicals on the Jewellery. It is advisable to store jewellery in an air-tight container as sent by Us (or in zip lock pouch). First wear your makeup, perfume – then wear your jewellery. Clean it with dry and soft cloth after wearing. This will keep your jewellery shining for years. 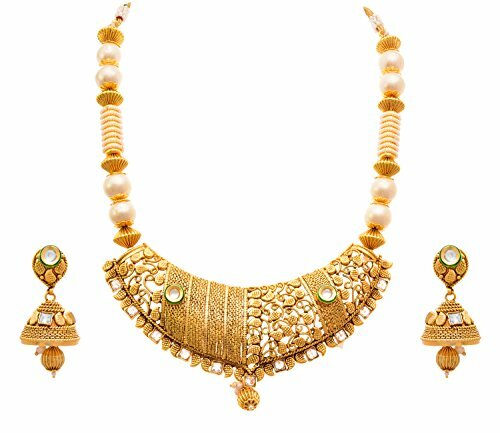 JFL – Traditional Ethnic Temple Laxmi Goddess One Gram Gold Plated Designer Long Necklace / Jewellery Set embellished with White Pearl & Jhumki Earring for Women & Girls. Base Material – Copper alloy. Stylish and Trendy Necklace Set from the house of JFL, perfect for all occasions. QUALITY – All our Jewellery is Export quality, Anti-allergic, High Gold Polish, Copper alloy, rust and corrosion resistant. No lead or Nickel so it wont irritate your skin. No Shisha hence light weight. The highest quality of gold plating further ensures a long-lasting shine. CARE – No direct Perfume/Deo/Chemicals on the Jewellery. It is advisable to store jewellery in an air-tight container as sent by Us (or in zip lock pouch). First wear your makeup, perfume – then wear your jewellery. Clean it with dry and soft cloth after wearing. This will keep your jewellery shining for years. 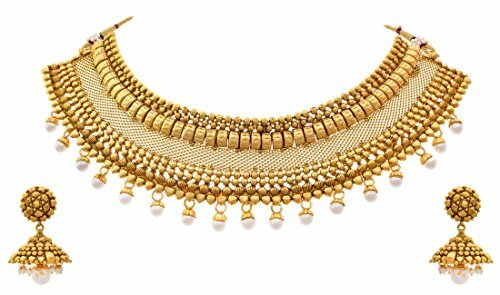 JFL – Traditional Ethnic Bridal One Gram Gold Plated Pearl Designer Choker Necklace set with Earring for Girls & Women. 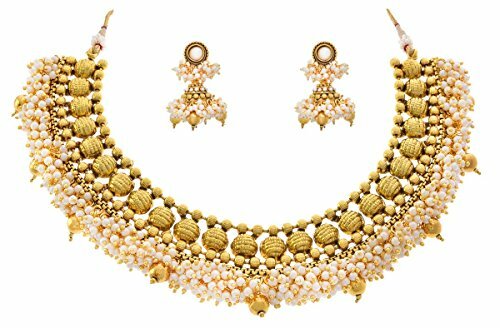 JFL – Traditional Ethnic Bridal One Gram Gold Plated Pearl Designer Choker Necklace set with Earring for Girls & Women. Base Material – Copper alloy. 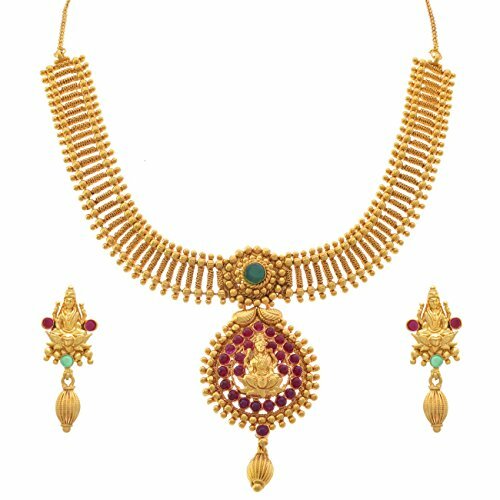 Stylish and Trendy Necklace Set from the house of JFL, perfect for all occasions. QUALITY – All our Jewellery is Export quality, Anti-allergic, High Gold Polish, Copper alloy, rust and corrosion resistant. No lead or Nickel so it wont irritate your skin. No Shisha hence light weight. The highest quality of gold plating further ensures a long-lasting shine. CARE – No direct Perfume/Deo/Chemicals on the Jewellery. It is advisable to store jewellery in an air-tight container as sent by Us (or in zip lock pouch). First wear your makeup, perfume – then wear your jewellery. Clean it with dry and soft cloth after wearing. This will keep your jewellery shining for years. 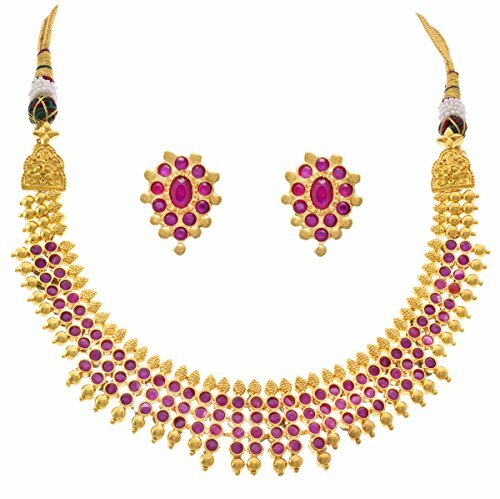 JFL – Traditional Ethnic Ruby Red Cz American Diamond One Gram Gold Plated Designer Necklace Set for Girls & Women. Base Material – Copper alloy. Stylish and Trendy Necklace Set from the house of JFL, perfect for all occasions. QUALITY – All our Jewellery is Export quality, Anti-allergic, High Gold Polish, Copper alloy, rust and corrosion resistant. No lead or Nickel so it wont irritate your skin. No Shisha hence light weight. The highest quality of gold plating further ensures a long-lasting shine. CARE – No direct Perfume/Deo/Chemicals on the Jewellery. It is advisable to store jewellery in an air-tight container as sent by Us (or in zip lock pouch). First wear your makeup, perfume – then wear your jewellery. Clean it with dry and soft cloth after wearing. This will keep your jewellery shining for years.